You can change your default comment settings at any time and have full control over whether comments appear immediately or comments are moderated and need to be approved by an administrator before appearing on your blog. 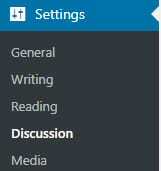 Comment moderation settings on student blogs attached to My Class are controlled in My Class > Settings of the class blog. If ‘Comment must be manually approved’ before a comment appears is selected this means all comments will go into moderation and they need to be approved by an administrator, teacher or editor before appearing on your blog. This option is commonly used on class and student blogs to ensure no inappropriate comments are published. A comment submitted by the post author is always published immediately; it isn’t sent into moderation. For example, if your student publishes a post on your class blog and submits a comment on their own post their comment is published immediately. When this comment setting is used comments can be posted by anyone and appear immediately on the blog. This option is occasionally used on educator’s personal blogs to encourage conversations in comments. This setting isn’t recommended as it can lead to increased spam comments. The better option is to use ‘Comment author must have a previously approved comment before a comment appears’. 2. Choose your preferred ‘Before a comment appears’ setting.